Would you like to try a little mead? Tour a Viking replica ship? Search for remnants of pirate raiders from the eighth, ninth, 10th, and 11th centuries? If the answer is “yes,” the Harvard Summer School’s program in Scandinavia is for you. 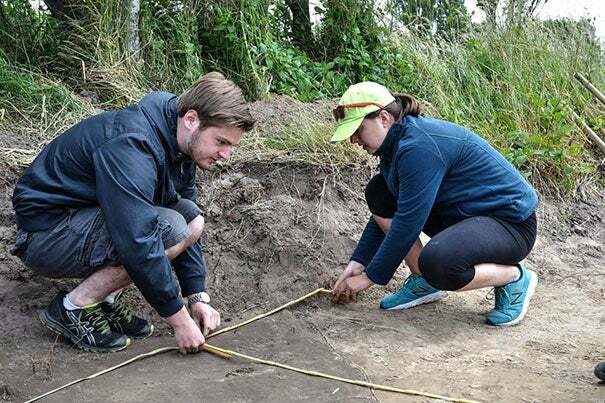 Run by Harvard’s Stephen Mitchell in collaboration with scholars from Aarhus University in Aarhus, Denmark, and the nearby Moesgaard Museum, the program immerses students in the Viking age through lectures, close readings of medieval sagas, museum visits, burial grounds, archaeological sites, and fieldwork. “It’s a very busy but wonderful way to teach,” said Mitchell, the Robert S. and Ilse Friend Professor of Scandinavian and Folklore, who co-directs the program with Aarhus scholar Pernille Hermann. Together they led a group of students, 12 from Harvard, on a summer journey in Denmark. 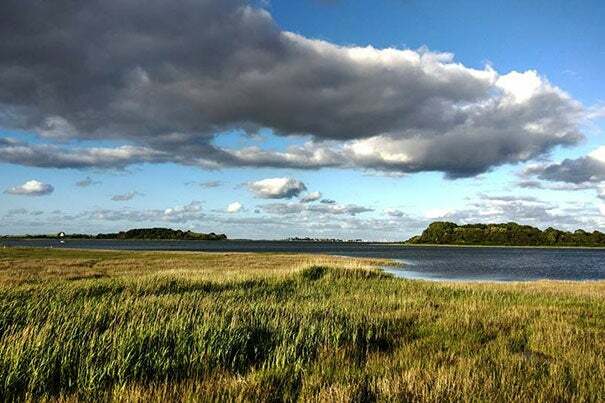 This year’s two-month course touched down in Aarhus, Copenhagen, and the Danish island of Samsø, home of a field school and an organic farm that yields potatoes, asparagus, and strawberries. In an area the size of Harvard Yard, the students harvested something else entirely. Discolorations in the sand are the only indications of where Viking-era structures once stood at the field school’s dig site. Harvard sophomore Jessica Ding uncovered animal bones, including a jawbone with an attached tooth, pieces of charcoal and burnt stone, and bits of amber. She also found shards of pottery. “If you find a piece that includes the rim of a pot, you can date it to a particular time period based on the shape of the rim,” Ding explained in an email, noting that some of the pottery pieces she uncovered were indeed from the eighth- to 11th-century Viking era. Some discoveries prompt more questions than answers. Last year, students found part of a woman’s brooch from ninth-century France. The date coincided with a Viking attack on Paris. An inquisitive spirit informs final projects. Standard papers are an option, but Mitchell happily accepts less traditional forms of scholarship. Last year one student drew water from a Bronze Age well, added a bit of honey, waited for it to ferment, and produced “a fabulous mead,” said Mitchell. Two others researched the origins of hammerscale, a “flaky or spheroidal byproduct of the iron forging process,” as noted in the Wikipedia entry on the topic that became their final project. Other past projects include a meal cooked in a fire pit using local herbs, knapped flint tools, and carded, spun, and dyed raw wool. That toolkit includes the famous sagas that describe Norse seafarers battling oceans and armies with seemingly equal verve. “Vikings go out on these massive adventures, serve foreign kings, tour foreign lands, and they bring back all this glory,” said Verrey, recalling the story of one particularly robust raider who is said to have fought off legions of attackers before meeting his death. The chance to acquaint himself with new people and different traditions was another program highlight for Verrey. 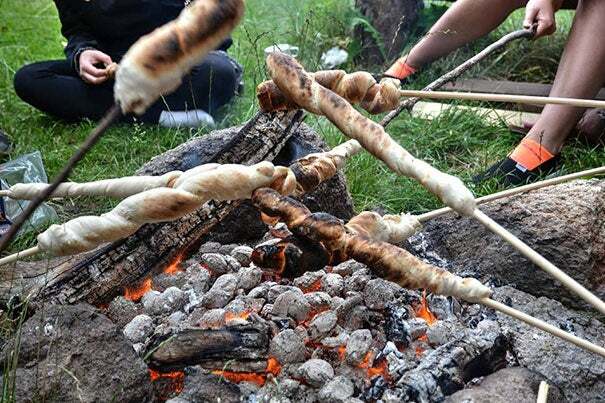 “You get to see how the world is through the perspective of another culture, to see what other people are like, and to see how other people view the world,” said the Chicago native, who took a particular liking to the Danish spin on a traditional American campfire treat. While Mitchell realizes that most students won’t pursue Viking studies after graduation, he also knows the program offers important lessons. A lecturer in Harvard's Creative Writing Program, Paul Yoon has published his third book, "The Mountain," a collection of short stories thematically linked by their protagonists' struggles with isolation and trauma.